A number of times throughout theyear, residents and students in Ann Arbor, Ypsilanti and the surrounding área annually celébrate a variety of festivals, fairs, parades and people 's ga therings. These cultural highlights, in which thousands of people particípate, take place within a vibrant, ongoing cultural scene that exists year around, created and defended by the people who Uve and work here. They are a vital part of the annual Ufe ofthis community. Each festival and gathering is unique and significant on its own merits. But taken all together, as a whole, and woven into the fabric ofour daily Uves, they reflect the full spectrum ofour altemative culture as it has developed in Ann Arbor and similar fronts around the world. A nu Arbor's most popular, or "mass" arts are music and film. There is a healthy music scène fiere, with fine local bands closely linked with the community. There is a lot of live music; every night of the week, bars and clubs feature rock, blues, jazz and country western music, giving young musicians a chance to work where otherwise there would be none. National acts appear throughout the year, either in local bars and clubs, or else by University organizations like Daystar that use CrisIer Arena, HUI Auditorium, or other large University buildings. , The U of M student film co-ops are the major stimulus for Ann Arbor's high appreciation and interest in film. University auditoriums for theatres, the co-ops show first-rate films from around the world coveringa diversity which includes major first-run movies, experimental, avant garde, and international masterpieces, revolutionary Third . World films, and old classics of the A hé menean screen. WS The up-coming Ann Arbor Blues & Mm Jazz Festival, this year exiled to Wind sor, Ontario, and the Ann Arbor Film Festival have been intemationally acclaimed as magnificent cultural events. The Blues & Jazz Festival presen ts the fïnest in blues and jazz artists white the Film Festival i features the best work of jt penden 1 16 já$A makers from around the worid. The combined Ann Arbor StreetArt Fair and the Ann Arbor Free Art Fair, this town 's largest yearly event, attracted over 1 00,000 last July. The annual Community Parks Program free summer concerts, the yearly Ozone Parade and the Hash Festival are true people 's events, organized as alternative institutions that thousands particípate in. The Medieval Festival and The Festival of Life attract upwards to 2,000 people yearly. The Future Worlds Conference is organized by Uhiversity activists and presents workshops and programs in alternative living pattems for the future, during its yearly festival conference. These many festivals and gatherings bring together and magnify different elements of a basically progressive culture practiced by tens of thousands in this área alone. The existence and growth of this culture are a basic element in making Ann Arbor and its environs a highly active and advanced community. Significant legal and political battles have been fought and won over the right to hold some of these cultural events. And the battle goes on to this day, with the refusal of City Republicans to allow this year's Blues & Jazz Festival to happen in Ann Arbor. These battles for the right to practice a culture ultimatèly lead to a . struggle for con trol of our Uves, of this community, and the institutions that k affect us. It brings us to struggle to WL créate new institutions that meet our needs, like this newspaper, food co-ops, free clinics, day v and child care centers, farms, I etc. It leads us to struggle 1 and trans form ora t a least reform existing f institutions and use their resources h in whatever áí -y way m pos sible ' to build a Sr strong base y of altemative institutions c(ipable of ful Y l'nS he needs of our very different Uves. The cultural future of Arm Arbor is intimately bound up with its poli tical future. In order for Ann Arbor to be able to continue to flower and develop as a progressive cultural center, it will have to continue to develop as a radical and progressive political center, in order to make rapid advances politically it is necessary to rally and organize masses ofpeople. To do this it will be necessary to use our culture as a unifying focal point forstruggle. We must deferid the cultural institutions that our community has initiated while also working to gain political chut in the city and county government. What follows is a list ofsome of the more important cultural milestones: OZONE PARADE The OZONE PARADE usually takes place in October. It used to be the U of M Homecoming Parade, complete with Big 10 consciousness, pantyraids, jocks and a plastic queen. A few years ago the homecoming parade was used as a forum for mass protest against the war in SE Asia. The next year the University decided to cancel the parade, because of apathy towards the event and also to avoid the embarrassment of having the homecoming parade taken over by "undesireables" who tarnish the Big U's image in the eyes of the alumni and their corpora te money.When the University nixed the parade, local activists and other crazies formed the Ozone Centrifical Committee and put on a parade of unmatched scale and variety. It followed the same rout as the traditional homecoming parade but the Ozone Parade featured forty or so floats, fïfteen marching televisions, two ad hoc marching bands, a three-quarter-mile-long balloon, a white gorilla, a walking airplane, rock, blues and jazz bands, the Queen Mother of the Gross National Product, Commander Cody and His Lost Planet Airmen's bus, Honeysuckle Rose, and countless other weirdos. This year the Third Annual Ozone Parade will take place in October. ANN ARBOR FILM FESTIVAL For the past eleven years Ann Artor has been the location of the world's largest festival of sixteen millimeter films. Cinema Guild, a University of Michigan film society, and the.Dramatic Arts Center, a group ot artists and performers, sponsor this week long event that draws hundreds of underground films from all over. The Festival in effect continúes all year with a tour that circlestheatres and institutions around the country and a film series featuring selections by European and American distributors. The Festival broadens out to other forms of media with video screenings, costume theatre, art displays, and coordinated radio activities. You can watch for this festival in March. FUTURE VVORLDS CONFERENCEFESTIVAL This is the third year for the Future Worlds ConferenceFestival. Organized by students and faculty at the U of M, it offers a broad variety of views and analysis of the future. Buckminster Fuller, Ralph Nader, Hunter S. Thompson, and many more have been guest lecturers during its three days of happenings, workshops and multi-media presen tations designed to prepare us for the future. Watch for this conference in March orApril. ANN ARBOR HASH FESTIVAL The Hash Festival is sometimes called the Hash Bash. It takes place every April lst on the U of M diag. 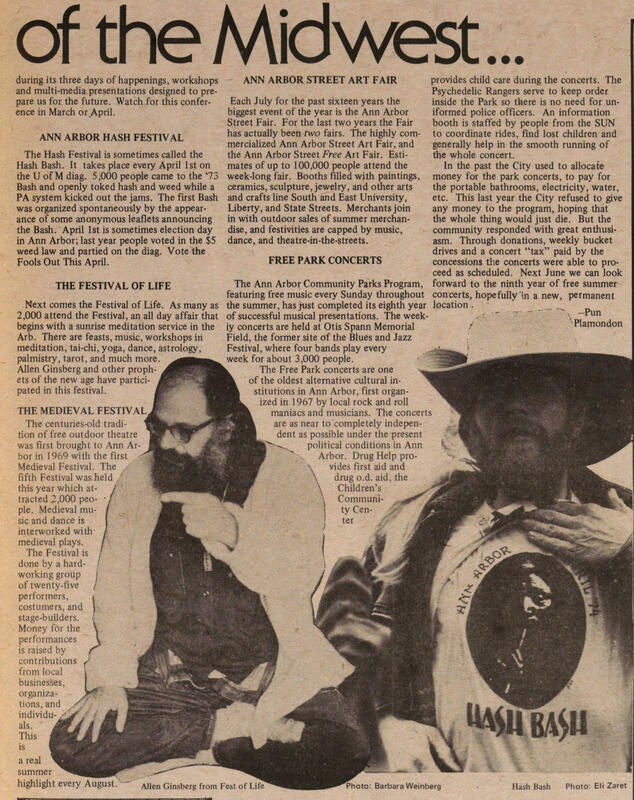 5,000 people carne to the '73 Bash and openly toked hash and weed while a PA system kicked out the jams. The first Bash was organized spontaneously by the appearance of some anonymous leaflets announcing the Bash. April lst is sometimes election day in Ann Arbor; last year people voted in the $5 weed law and partied on the diag. Vote the Fools Out This April. THE FESTIVAL OF LIFE Next comes the Festival of Life. As many as 2,000 attend the Festival, an all day affair that begins with a sunrise meditation service in the Arb. There are feasts, music, workshops in meditation, tai-chi, yoga, dance, ástrology, palmistry, tarot, and much more Allen Ginsberg and other prophets of the new age have participated in this festival. i THE MEDIEVAL FESTIVAL The centuries-old tion of free outdoor theatre was first brought to Ann bor in 1969 with the first Medieval Festival. The .. fifth Festival was held this year which attracted 2,000 people. Medieval music and dance is interworked wiür medieval plays. The Festival is done by a hardworking group of twenty-five performers, costumers, and stage-builders. Money för the performances is raised by contributions f rom local businesses, organizations, and A . . ma is % a real H summer j highlight every August. ANN ARBOR STREET ART FAIR Each July for the past sixteen years the biggest event of the year is the Ann Arbor Street Fair. For the last two years the Fair has actually been two fairs. The highly commercialized Ann Arbor Street Art Fair, and the Ann Arbor Street Free Art Fair. Estima tes of up to 100,000 people attend the week-long fair. Booths filled with paintings, ceramics, sculpture, jewelry, and other arts and crafts line South and East University, Liberty, and State Streets. Merchants join in with outdoor sales of summer merchandise, and festivities aie capped by music, dance, and theatre-in-the-streets. FREE PARK CONCERTS The Ann Arbor Community Parks Program, featuring free music every Sunday throughout the summer, has just completed its eighth year of successful musical presentations. The weekiy concerts are held at Otis Spann Memorial Field, the former site of the Blues and Jazz Festival, where four bands play every week for about 3,000 people. 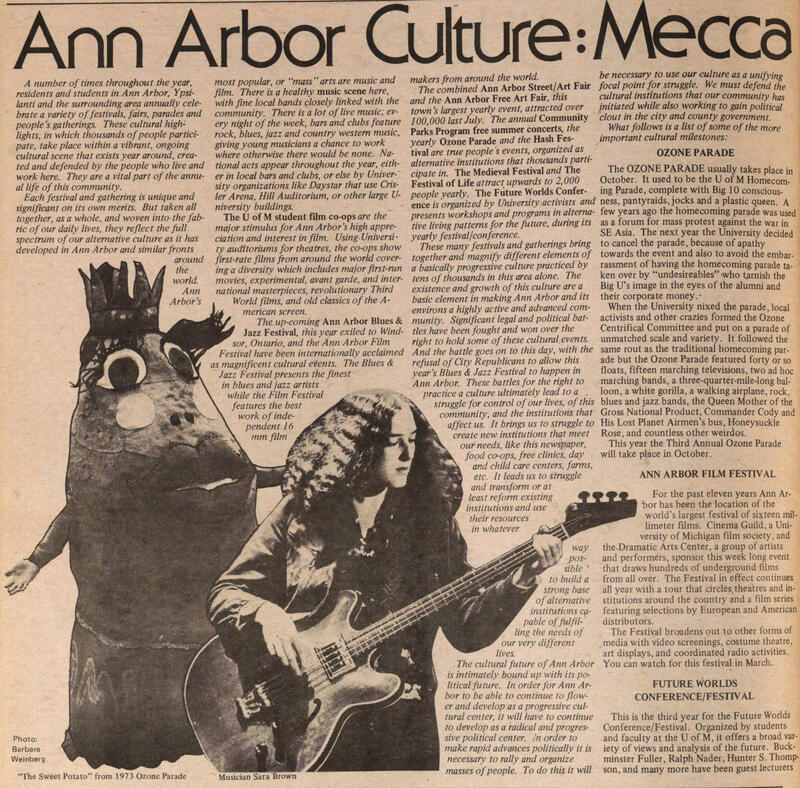 The Free Park concerts are one of the oldest alternative cultural 1 stitutions in Ann Arbor, first organized in 1967 by local rock and roll mamáes and musicians. Ihe concerts are as near to'completely independent as possible under the present jfesjfc political conditions in Ann Arbor. Drug Help vides first aid and drug o.d. aid, the Children's ,00 ty Center provides child care during the concerts. The Psychedelic Rangers serve to keep order inside the Park so there is no need for uniformed pólice officers. An information booth is staffed by people from the SUN to coordínate rides, find lost children and generally help in the smooth running of the whole concert. In the past the City used to allocate money for the park concerts, to pay for the portable bathrooms, electricity, water, etc. This last year the City refused to give any money to the program, hoping that the whole thing would just die. But the community responded with great enthusiasm. Through donations, weekly bucket drives and a concert "tax" paid by the concessions the concerts were able to proceed as scheduled. Next June we can look forward to the ninth year of free summer concerts, hopefully'in a new, permanent location .